Marine biologist Ryan Kempster noticed a very strange thing when he brought an electrical field close to the egg case of an embryonic shark: The unborn — and highly vulnerable — baby altered its movements by ceasing its gill function. It's a strategy, he believes, that helps baby sharks to sense when a predator is near — what causes a life-preserving change in behavior. But now, using this insight, Kempster hopes to develop a non-lethal shark repellant. We contacted him to find out how he plans to make this work. Adult sharks are also known to use highly sensitive receptors to detect fields emitted by potential prey. But now it appears that their babies are capable of a similar trick, though it's a strategy that helps them from becoming prey. The specific shark that was studied, the bamboo shark (Chiloscyllium punctatum), is unique from others in that its embryos develop completely independently of their mother inside the egg case — and for up to five months. These are typically deposited by the mother on or near a surface where they are vulnerable to predators like teleost fishes, marine mammals, large molluscan gastropods — and even other sharks. And in the days and weeks following their birth, the electroreception still serves to protect the sharks from predators. Despite its close quarters and relative isolation from the outside world (not to mention a complete absence of real-world experience), the embryo can recognize dangerous stimuli and react with an instinctive avoidance response. Electroreception is made possible through the presence of minute electric field gradients — what travels through an array of openings or ‘pores' at the skin's surface. And it's this knowledge, says Kempster, that will assist in the development of an effective — and non-lethal — shark repellent. "There are a variety of commercially available non-lethal electric shark repellents, but the scientific data supporting their effectiveness is limited," he told io9. "So over the years I have been assessing variation in the electrosensory systems of multiple shark species, during development and into adulthood, to determine if individuals change the way they sense and react to predator-like stimulus." Kempster, whose study appears today in PLOS, works with the UWA Neuroecology Group at the University of Western Australia. 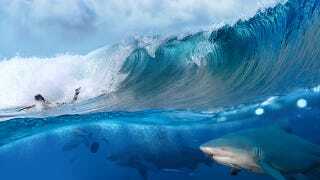 His focus is on the the sensory biology of sharks — and he has the specific goal of coming up with the information necessary to produce a device that can protect swimmers and surfers from potential shark attacks. "The results of this study are a stepping stone to producing an effective device," he says. His team discovered that, not only do shark embryos respond to predator-like stimulus by staying still and stopping their breathing, but they can actually remember previous stimuli and reduce their reaction to it during future encounters. "This means that sharks may become conditioned to repellent devices if the signal these devices produce does not change substantially over time, thus reducing the effectiveness of a repellent the longer a shark encounters it," he told us. Interestingly, and on a related note, stingrays have been observed to stop breathing in response to predator-like stimulus. And fascinatingly, some deer and chipmunks have been shown to change their heart rate in response to predators. You can read the entire study at PLOS.